My attempt to explain why the final bacteria monster goes from having two eyes to only one. With a special guest at the end! EDIT: Gave it a different title. It was late afternoon in Megakat City, going on into early evening. Ted, a uniformed city worker, grumbled as he pushed rubble off of the street and onto the sidewalk with a push broom for easy pickup later. As he worked, he cast a glance at the still smoldering pile of melted... whatever it was. One of those big purple monsters they were saying on the news had been created by Dr. Viper. Specifically, the one the SWAT Kats had killed down the street from the sagging, blasted ruin of Megakat Biochemical Labs earlier that morning. The pile had been cordoned off with yellow biohazard tape. Not that Ted figured anyone in their right mind would go near the stuff, considering it stand to high heaven. Even the bulldozer used to push it all it into its current state had to be hosed off. Most of the city workers had gone home for evening. The only people in the quarantined section of the city surrounding Megakat Labs were Ted and those two layabouts, the Schlepper Brothers, who were currently sitting on the edge of the rear portion of their big, ugly dump truck's tipper sipping milk and stuffing their faces with tuna chips. After they'd bulldozed what was left of Dr. Viper's monster into the big stinking pile it currently sat in, they'd decided to just sit on their butts and watch everyone else work. Lazy jerks, Ted grumbled, leaning on his broom. What were they doing here anyway? Ted himself didn't like staying any later than he needed to, considering the power was out in this section of town, and as it got darker, it got spookier. But he was young and needed the overtime. Suddenly he was grateful to have Burke and Murray for company; if nothing else, the Schleppers' presence meant he wasn't alone here in the lengthening shadows. Something else to "thank" the SWAT Kats for, he'd heard. Apparently they'd killed the third monster by dropping sliced powerlines onto it. 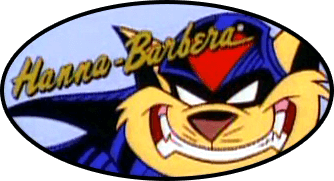 Nearby, a Megakat Power and Light van sat parked on the cordoned-off metal bridge where the SWAT Kats had killed the third and final bacteria monster. A two-man crew of hardhatted workers from the power company had just finished repairing the lines. They were glad to be done. The smoldering brown pile surrounded by yellow tape stank like rotten fish on a hot summer day, and the two had had to hold their breath the entire time. "I'm glad to bet gettin' outta here," said the first worker, the older of the two, as he loaded their equipment into the trailer hitched to their van. "Yeah," said his junior partner, "the sooner the Enforcer hazmat squads get here and clean that crud up the better." The older worker got on his walkie-talkie. "Hey, Stone, this is Crew 4 out at the Katalina Overpass. We just finished reconnecting those downed lines. You boys can flip the switches and get the power back on to this section of town, I mean, if it ain't too much trouble." "Sure thing," Stone's voice crackled through the radio. "I'll get on it right away." Nothing happened. Typical Jerry Stone, though the veteran worker, shaking his head. "Right away" always meant "in a few minutes." Oh well. Not their problem anymore. He and the younger worker got into the van, he behind the wheel and his junior companion riding shotgun. He started the engine, turned the headlights on... and suddenly both workers screamed in terror as the van's headlights revealed an enormous, cycloptic purple horror, its enormous, grinning maw opened wide to swallow them whole. No, impossible! thought the older worker in his panic. There were only three monsters. Only three! Unless... he remember vaguely seeing on the news footage that at least one of the monsters had two eyes, the other two having only one like this one. The original, he was certain, had had four, which meant these things divided. Like amoebas, he remembered, long forgotten courses in high school biology returning to him now. What if that remaining two-eyed one had divided and nobody had known? Ted pulled back the sleeve of his city worker's uniform and looked at his wristwatch. Yeah. Way past time to knock off. He heard laughing and saw Burke and Murray nearby hopping down from the tilter of the truck, crumpling up their milk cans and empty chip bags, tossing them onto the asphalt. "Really guys?" Ted grumbled, the first time he'd spoken aloud to the pair since arriving. "Aw, shaddup," said Murray, "just think of it as more work to get paid for." With a dumb, wheezing laugh, the short kat walked around the back of the dump truck, toward the driver's side. Burke hesitated, then picked up the chip bags and cans and threw them into a nearby trash can, spreading his hands towards Ted in an annoyed gesture that wordlessly asked "Happy now?" Ted nodded his thanks. Murray glowered at his brother, but Burke simply shot the shorter Schlepper sibling aon obscene gesture and headed for the passenger's side of the truck. "Why you always gotta be such a jerk, Murray?" Ted heard him ask. "I didn't hear you raisin' any objections when we was tauntin' Furlong and Clawson!" Murray growled. "That's different. Those guys wrecked the Enforcer building. They deserve whatever they get. That guy's a hardworking schlub like us. He don't deserve that kinda treatment." I work harder than you, you big, fat oaf, Ted thought; even though he was secretly glad to learn at least one of the Schlepper Brothers had something resembling a conscience. The ground shook. The impact wasn't that heavy. Something big but clearly without too much weight was approaching. Ted froze. Maybe it was the power trying to come back on? The streetlights flickered. 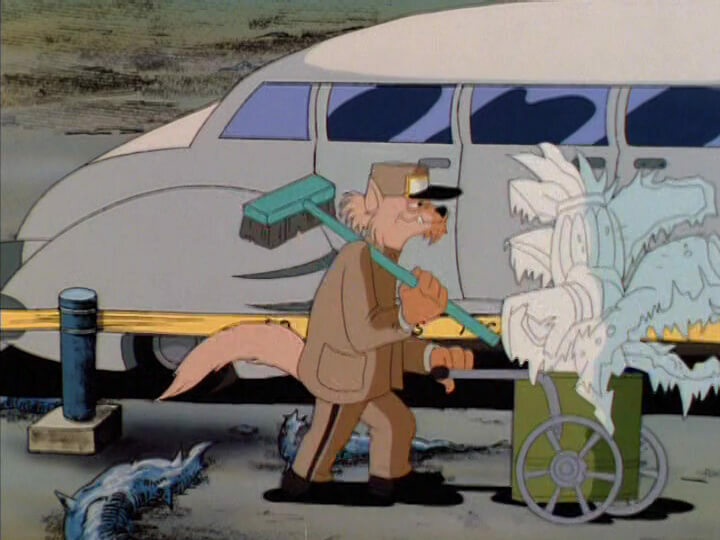 Getting his broom, Ted started walking down the street towards the parking lot where he'd left his car, his path carrying him towards the Schlepper dump truck, which sat in the middle of the street; Burke and Murray hadn't gotten in yet and stood looking around in mild confusion. There it was again. Closer this time. Ted stopped. Suddenly, he saw Burke and Murray standing at the rear of their truck, gesturing and shouting frantically, but indistinctly; they were merely blubbering in terror. Murray, both his big eye and his little eye wide open, was pointing at something behind Ted, while Burke was making frantic gestures, motioning for Ted to come over. "What's goin' on?" Ted demanded, annoyed. "I can't make out what..."
He trailed off as he turned around. A dark shape had rounded the corner of one of the buildings at the end of the block, behind the roped off pile of burnt, melted monster. In that instant, the power came on, and the streetlights illuminated the impossible - a fourth big purple creature, grinning hideously, its single eye rolling in its socket before lighting on Ted, standing exposed in the middle of the street only a block or so away. With a monstrous bellow, the thing finished rounding the street corner and started walking towards him, gradually picking up speed. Ted's annoyance turned to terror and he screamed. Throwing down his push broom, he turned and ran towards the Schleppers' dump truck. Also screaming, Burke and Murray got into their truck, slaming the door. Murray turned the key and the engine fired to life, and then the truck started to drive off down the street, slowly at first, but gradually picking up speed. The bacteria monster sploshed through the piled up remains of its "brother" with total indifference, having an eye only for the fleeing city worker if it could catch him... and the far larger treat of the big, noisy truck. Ted ran after the departing dump truck, frantically waving his arms and legs. His hat flew off. "Don't go!" he shrieked. "Don't go!" The truck kept right on driving. Either they didn't hear him or were only interested in saving themselves. Ted screamed again, the ashphalt under his feet splitting from the impact of the huge creature's footsteps. It was only a few feet behind him. Ahead, Murray plowed through a car that sat angled across the road, spinning it away. Ted ran around it, still screaming. He looked over his shoulder. The car being in the monster's way provided only a minor obstacle. Seizing the vehicle in its huge, gooey hands, the creature flipped out out of the way to land crashing upside-down on the sidewalk. In the truck cab, Burke looked in the rearview mirror, watching the frantic form of Ted running after them. "Murray, stop!" he said. "What?" cried Murray. "Are you nuts?!" "Can fend for himself!" Murray replied, really putting the pedal to the metal, silently urging the hunk of junk of a truck to go faster. "Oh, you heartless son of a--" Burke began. "Fine!" Murray said, and slowed a little, but didn't dare outright stop. "And watch what you say about Ma!" Seeing the truck beginning to slow down, jubilation and relief ran through Ted, but another glance over his shoulder brought a fresh wave of terror, and he willed his legs to pump harder, and before he knew it, he was scrambling into the dump tilter of the truck. Once Murray was certain their passenger was aboard, the floored it again. Burke was screaming at him to go faster. In back, the worker they'd picked up was also screaming. Murray might've even been screaming, himself, but he wasn't sure. "Come on, you piece a' crap!" he urged the truck, bouncing up and down in his seat in panic. "Come on, Murray, go faster!" Burke urged desperately. "Must go faster!" came the voice in back. "Yaaaaahhhh!" Murray screamed as the truck came up to the intersection. He swung the wheel, taking the turn hard, clipping a fire hydrant, sending a geyser of water shooting into the air. The truck turned so hard the driver's side wheels left the pavement, and Murray prayed that it wouldn't overturn. Blam! The driver's side wheels hit the street again. But Murray's relief was short lived. Hearing an approaching vehicle, he saw an tanker truck barrelling down the street towards them, and realized with sudden horror he'd turned left onto a one-way street. He spun the wheel, driving onto the sidewalk as the tanker shot past them, its driver hitting the brakes, screeching to an abrupt halt to avoid colliding with the bacteria monster as it rounded the corner. The driver got out and ran, screaming. The monster pursued him, its huge feet squishing sloppily in the water filling the street from the fire hydrant Murray had hit, but he ducked into an alleyway and was able to escape. Stopping the truck a good distance down the street, Burke, Murray and the city worker watched as suddenly a lone Enforcer cruiser swung into view from the opposite direction, skidding to a halt. The gull-wing door opened and a pretty, tough-looking she-kat with jet black hair except for incongruously white sideburns, dressed in the uniform of an Enforcer sergeant got out, pulling her sidearm from her holster. The monster turned and roared down at her. In its mindless rage it grabbed the tanker truck and lift it over its head, intending to throw it at this puny Enforcer sergeant. The Enforcer noticed that "Water" was written on the tank. It was a water tanker. She frowned, remembering what she'd heard in the reports about these things being weak to electricity. Then she saw that in addition to lifting a water truck high above its head, the monster was also standing in ankle-deep water pumping strongly from a nearby hydrant. She pointed her gun at the tank of the truck over the creature's head, squinting down the barrel, and fired. The laser blast punctured the tank, causing water to pour down over the monster, who, apart from shutting its single eye in apparent annoyance, didn't react, or relinquish its hold on the vehicle. Then, she turned and took careful at a transformer on an electrical pole and fired again. She took a couple of steps back, bumping up against the hood of her cruiser, as sparks flew through the air, and one single live wire detached and fell to the street. The street currently flooded with water. The bacteria monster dropped the water tanker truck and convulsed hideously as several thousand volts of electricity flowed through its body. It contorted and twisted, eye rolling back into its head, its perpetual sadistic smile becoming a grimace of pain, as it changed from a very unnatural purple to a revolting brown... and melted into a slimy puddle that was promply swept away down a nearby drain grate by the water still rushing from the hydrant. The young sergeant strode confidently through the water, dress shoes splish-sploshing, the bottoms of her pants legs getting soaked, but she didn't care. She had people to check on. She recognized the Schlepper Brothers immediately from her uncle's descriptions of them. They'd gotten out of their stopped truck and walked over, along with a kat in the uniform of a city worker. A fourth kat, who she later learned was the driver of the water tanker, peeked cautiously out of an alleyway. "Is everyone all right?" she asked. "Uh, y-yeah..." said the small Schlepper sibling. Murray, she thought his name was. "That was amazing!" cried the bigger brother. Burke, was it? "Who are you?" "Sergeant Felina Feral, Enforcers," she replied, holstering her pistol. "You could say I'm new in town." Last edited by Kooshmeister on Fri Aug 17, 2018 1:15 am, edited 5 times in total. New in town? Well hello stranger! Nice to meet you... oh, it's a story. That's an interesting premise, that there was one more that was unaccounted for. Good thing Felina was able to rise to the occasion! This would make for a good side story alongside the original episode. I've always thought the cleanup crews in Megakat City must have pretty good job security. When a kat-bacteria monster divides itself, is that considered meowtosis? Mikazo wrote: That's an interesting premise, that there was one more that was unaccounted for. Good thing Felina was able to rise to the occasion! This would make for a good side story alongside the original episode. Well, the genesis for this is of course the infamous eye number screwup; I figured it'd be interesting if the explanation was that final (two-eyed) creature divided offscreen and nobody noticed, something several people have suggested in the past whenever I bring that particular blooper up. Felina showing up at the end to save the day was a last minute decision, and one I'm pretty proud of. Mikazo wrote: I've always thought the cleanup crews in Megakat City must have pretty good job security. Mikazo wrote: When a kat-bacteria monster divides itself, is that considered meowtosis?